Standing in the recesses of Whitten Oval after the Cats’ first loss of the season, Geelong ruck Erin Hoare expresses a range of discordant emotions in our post-match interview. Elated to have played in her first game of the year after foot surgery in September, she says she is “devastated” to have lost the all-important clash against reigning premiers the Bulldogs. “This ground is phenomenal,” she says. Rebecca Goring of the Cats (left) is tackled by Katie Brennan of the Bulldogs at Whitten Oval. I do know. My best attempt — as a fan, as someone on the outer — is to describe it to Hoare as having a “community feel” that attracts a very different kind of crowd to AFL men’s football. Fans of women’s sport, the broader LGBTIQ community and those interested in gender equity more broadly — these are the people I see drawn to AFLW matches, many of whom would have made the trip to Footscray for their first ever match of Australian rules football on Friday. “I’m quite strong in the belief that AFLW is different and that is why it is so special,” Hoare says. “Being different is something we can, we should and we have the right to embrace … there’s calls for it just to be seen as ‘sport’ [as opposed to women’s sport], but there’s a part of me that thinks that women’s sport is so special, and has such advantages over other sports, that it’s a strength that we’re women’s sport. Indeed, it was once again about more than just sport when Collingwood ran onto Victoria Park several hours earlier for the first time in their women’s team’s history. It was in the face of that history that some of those same, and on this occasion, neutral, supporters returned and even joined in the raucous applause that accompanied the Pies’ women’s team on Saturday. 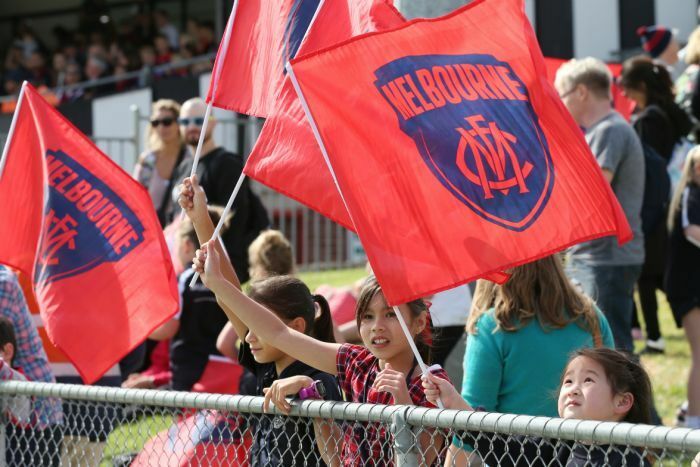 And, while it may have taken until late in the fourth quarter for their team to score, it was impossible to ignore the fixated, glowing faces of young girls in the crowd, reminiscent of Michael Willson’s formative picture of the cultural revolution taking place in this country around women’s sport. With the game having already been delayed for 45 minutes before the first bounce due to “technical issues”, the ground was plunged into darkness midway through the second quarter. 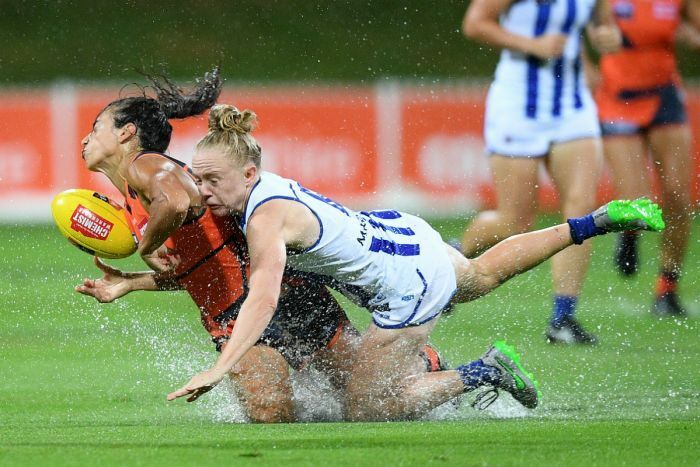 That lightning should strike twice is no doubt an issue of the time of year in which AFLW is played, but also of the substandard infrastructure the women’s game is sometimes provided. 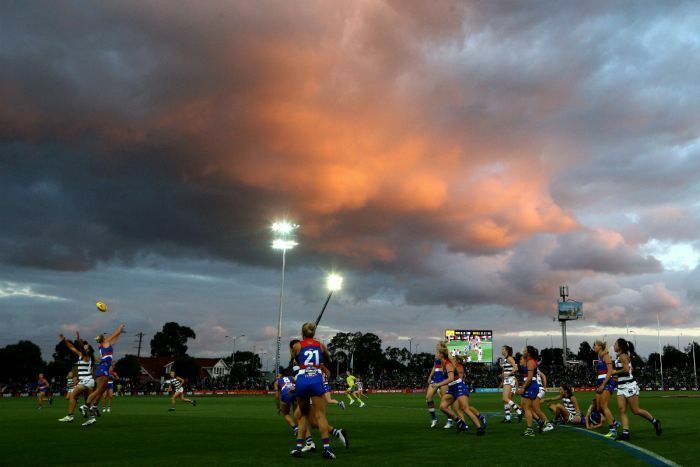 While suburban venues are used in part because the AFL believes in harnessing and growing the league’s grassroots appeal, they also present serious challenges for AFLW’s maintenance of professional standards. The great irony in the chaos on Friday night was that it stole the limelight off yet another thumping Kangaroos win — as sure a sign as ever of the competition’s healthy future. The risk in hosting games at these “boutique” grounds, then, is that charm is often traded for the well-oiled professionalism afforded to men’s sport as a given. In that context, perhaps the best AFLW news for round two is the announcement that the Federal Government is pledging $15 million for the redevelopment of Princes Park, which will turn the ground into a high-performance women’s league training facility with an upgraded oval, women’s coaching education hub, sports injury prevention and research centre and allied health centre. With growing conjecture around the rate of ACL injuries in AFLW and women’s footy more broadly, these are the necessary strides towards professionalism that will nurture and grow the competition while maintaining its unique “community” vibe. Kate O’Halloran is a sportswriter and former Victorian cricketer. She hosts AFLW radio show Kick Like a Girl 12-1pm Mondays on RRR and will be writing a Monday column on the AFLW for the ABC. Next articleIs the African Union fulfilling its mandate?